Our anti-spam tips have been designed to help businesses reduce the risk from email-borne threats and the volume of spam email they receive. Most of our tips for reducing email spam concern features that should exist in spam filtering solutions. These features can be activated and optimized to protect your business from risks such as malware downloads and phishing attacks, and reduce email spam. One of the best anti-spam tips we can provide is education. The majority of cybercriminals and spammers rely on the weakest link in your online defenses for their attacks to be successful – your employees. By educating your employees on how to recognize potential threats and spam – and report it – your business can reduce the amount of spam it receives and its potential impact. There are no scenarios in which educating your employees about email-borne threats and spam email is a waste of resources. However, as it may take some time for the educating of your employees to be completed – and because malware downloads and phishing attacks are a current threat – implementing the following tips for email spam can save you time and money today. The first of our tips for reducing email spam is a common problem. Practically every email filter conducts checks against Realtime Block Lists or RBLs. These are blacklists containing the IP address of servers known to distribute spam email. Typically, RBL checks detect up to 97% of spam email sent to your business. If you are receiving a high volume of email spam, it may be possible that the Realtime Block Lists are not being updated regularly and you should speak with your email service provider. If you continue to receive a lot of email spam after checking the Realtime Block Lists are being updated, the next of our anti-spam tips is to adjust your email filter´s acceptance threshold. Each incoming email goes through a series of front-end tests and is assigned a score depending on the likelihood of it being spam. By reducing the acceptance threshold, you will prevent emails with a higher likelihood of being spam from being delivered to your users´ inboxes. The “SMTP handshake” protocol is sometimes an optional front-end test that may not yet be activated in your email filter. By activating the protocol, your inbound mail server will look for HELO commands, Fully Qualified Hostnames and Resolvable Hostnames, and reject emails originating from addresses lacking DNS A or MX records. This process may require you add certain suppliers or customers to a “whitelist” of approved senders if their mail servers are incorrectly configured. One of our most effective anti-spam tips is to engage Recipient Verification Inspection. This feature checks that each inbound email is addressed to a valid user. Cybercriminals and spammers often address emails to “info@”, “sales@” or “admin@” in the hope that the business has a catch-all email account to collect incorrectly addresses email. Their aim is to have their emails opened by anybody within the business – they do not particularly care who. Whereas RBL checks identify email spam from known sources, greylisting can help reduce email spam sent from previously unknown sources. It does this by rejecting every inbound email and requesting that they are sent again. Spammers´ servers are often too busy sending out emails to respond to the request and the spam email is rejected when it is not returned. This process can be bypassed for known safe email addresses by adding them to your whitelist of approved senders. Reducing the volume of email spam your business receives will have the effect of reducing the number of emails with malware payloads. However may not eliminate them altogether. Consequently we recommend that, even though you might have an excellent anti-virus engine protecting your network, you have a mechanism for scanning each inbound email for viruses. It is always better to prevent malware entering your system that catching it with a retrospective virus scan. Malicious URLs are those typically found in phishing emails. Some email filters contain mechanisms that check links within emails against “URIBL” and “SURBL” databases to identify URLs and domain names frequently found in phishing emails. By scanning each inbound email for malicious URLs, your business will be protecting itself from phishing attacks and drive-by download attacks and reducing the chance that it will be the victim of cyberfraud or theft. Most computer users are aware of the risks of downloading files with certain suffixes (.exe, .bat, .scr, etc.). Consequently cybercriminals are known to change suffix names to circumnavigate filtering mechanisms. With MIME filtering software, it is possible to identify disguised files and prevent their delivery. It is also a good policy to only exchange downloadable documents via secure file sharing portals such as Dropbox and Google Drive. The last of our anti-spam tips is a tip to prevent your business from being blacklisted as a source of spam. By scanning outbound mail for spam and viruses, you ensure that the delivery of your corporate email is not delayed due to misspellings or the overuse of a spam keyword. It also ensures that none of your users have introduced a virus into your network if, for example, they prepared a file attachment on a malware-infected home computer and then uploaded it onto their work device. Most email services incorporate proprietary email spam detection technologies, although the use of dedicated, third-party spam filters to analyze incoming mail significantly enhances spam detection rates. Microsoft has incorporated anti-spam and anti-phishing functions into Office 365, yet even with recent improvements to these features, the spam detection rates are inferior to dedicated third-party solutions. Organizations that do not add an extra layer to their email defenses are likely to continue to experience problems with spam and phishing emails. A defense in depth approach is needed to significantly enhance Office 365 security and protect against ever evolving malware and ransomware threats and sophisticated phishing attempts. 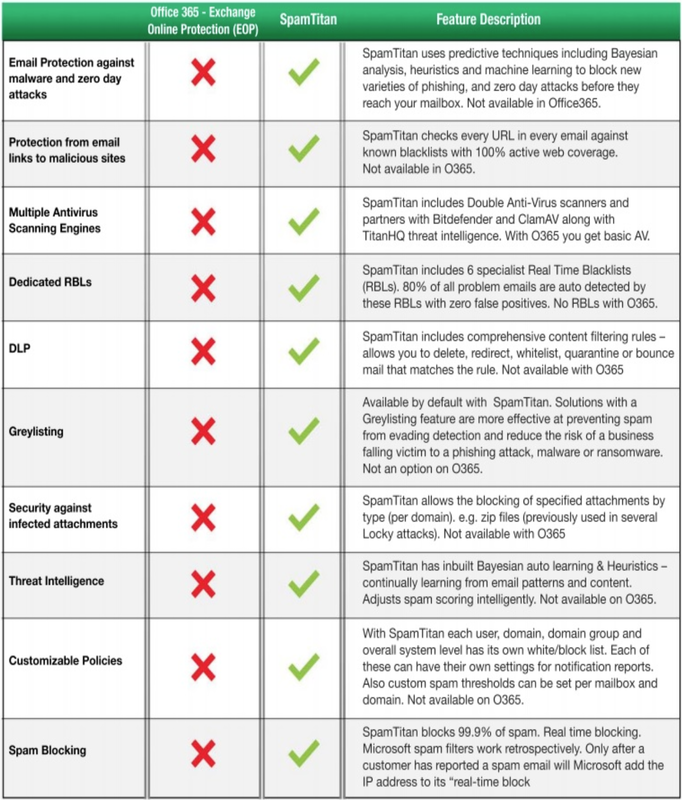 By layering SpamTitan on top of Office 365, users benefit from SpamTitan’s predictive techniques such as Bayesian analysis, machine learning, and heuristics, which are lacking in Office 365. These features greatly improve protection against new and evolving threats and ensure malicious messages do not get delivered to inboxes. 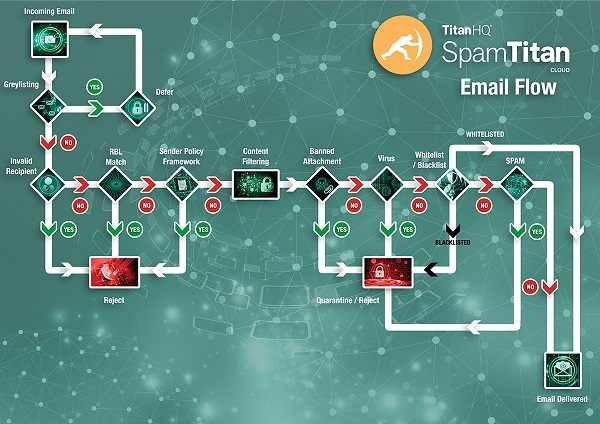 The image below details some of the advanced spam filtering mechanisms that have been built into SpamTitan which are not present in Microsoft’s default Office 365 security offering. These techniques are now essential for blocking new malware, spear phishing attacks, and other email-based threats. SpamTitan is an industry-leading spam email filter that has received thirty-five awards from the Virus Bulletin anti-spam comparative review for its high spam detection rates. Using a combination of versatile front-end tests – including greylisting – SpamTitan detects 99.97% of spam email, and mitigates the risks from email-borne threats with MIME-enabled dual antivirus software provided by Bitdefender and ClamAV. SpamTitan has two deployment options. SpamTitan Gateway is a virtual filter deployed between a business´s firewall and its mail server, while SpamTitan Cloud is a cloud-based solution that can be implemented by a simple redirection of a business´s DNS. Both deployment options are easy to configure via a browser-based interface, and both have a comprehensive reporting suite to assist with determining the optimal settings for your business. 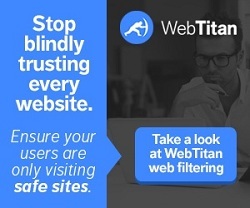 If your current email filter does not have all the features required to reduce the risk from email-borne threats and the volume of productivity-sapping spam emails your business receives, you are invited to try SpamTitan free for thirty days. Our offer consists of the most appropriate SpamTitan solution for your requirements, including our cloud based anti spam service and gateway solution, and full technical and customer support to help you achieve the highest level of protection against email-borne threats and spam emails. Contact us today for more details about our offer, or for further information about our anti-spam tips.